One of my favourite things about Africa so far has been the kids. They almost always seem to be smiling. An despite the fact that it seems the first thing they learn to say is “donnez-moi une cadeau” they seem very happy. After riding the famous iron ore train from Nouadhibou to Choum, I headed to the town of Atar for a much needed shower and a couple days relaxation. 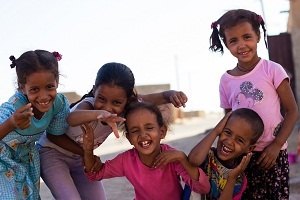 While in Atar, Mauritania I ran into a couple of kids on the street and went to take a couple photos of them. They asked to see the shots, and when I tried to I realized that I had left my memory card in the computer. I told them I would be back, and left to get my memory card. When I came back, I think they had told the whole neighbourhood about my camera’s presence. After about 15 minutes of shooting a photo followed by being attacked by kids looking at the LCD (and getting their fingers all over the lens), I had to retreat into hiding. It was a lot of fun and the laughter in the kids’ voices when looking at the photos made it all worth it. Rough street photos like this are a challenge. The kids can all push to get into the shot and they don’t understand how the camera works really (for most of them, this was the first camera screen they had seen themselves on). Thus, you kind of just have to wing it. Figure out where your light is coming from, meter your exposure for their faces, and aim your focus on the most interesting subject’s eyes. Also, you should try to be at their eye level or lower. I shot these all while sitting down on the ground. In terms of equipment, I find that a 50mm prime lens works wonders here because it gives great depth of field, is fast, and is small enough not to look suspicious. A lens like a 24mm 2.8 would also be good in this situation as the kids tend to get too close to the camera for a 50mm to capture all of them.